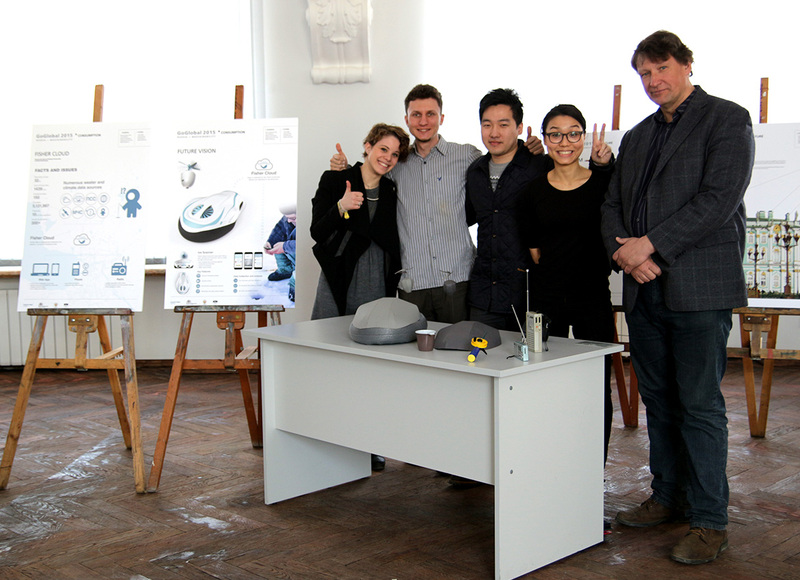 This Project was developed during the one month “IDE 2015 GoGlobal ” program in St. Petersburg Russia. The “Consumption” topic in Saint Petersburg was presented to us differently from what we expected. The problems caused by consumption are mostly reflected on the marine environment, and that was our starting point. When researching this topic we became fascinated by the ice fishing practice, and more specifically by the its hazards. 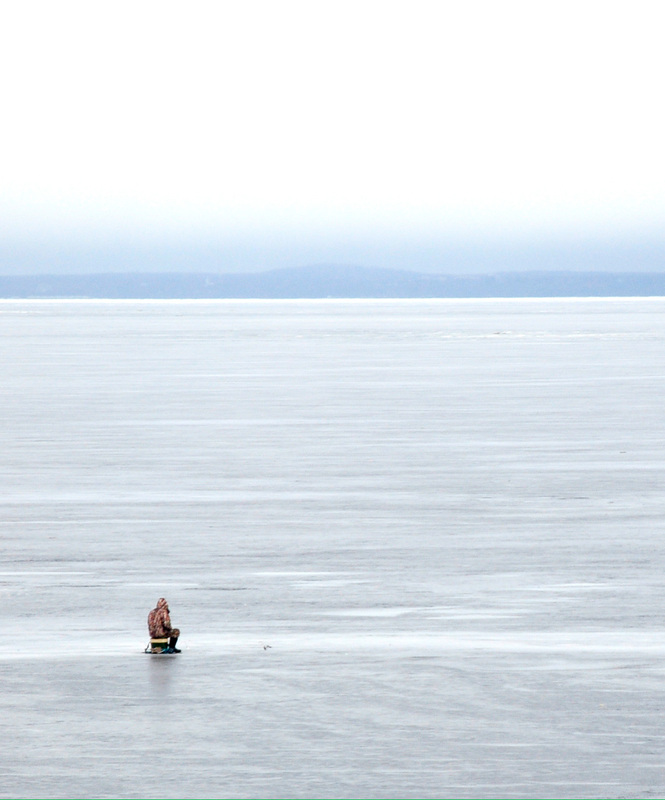 Every year there are hundreds of cases of fishermen falling thru or drifting away because of the ice breaking. Moreover, because of climate changes and increasing ships traffic, these ice breaks happen more often and more unpredictably every year. So we decided to help the fishermen community of St. Petersburg. We carried on a research into the ice fishing word. We went ice fishing in the bay, studied and interviewed the fishermen and did a bench marking analysis on fishing tools. We found out that 10% of Saint Petersburg (5 Million) population is involved in this activity and they have been building a strong community lead by the Fishermen Club, which has a website with a very active forum. We meet with the Club chairmen and they gave us the main lead for our project. 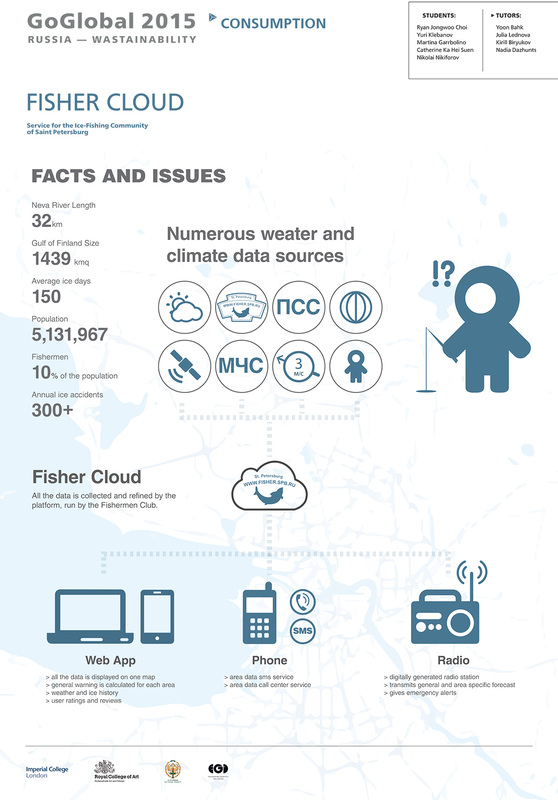 What the fishermen really need to be safer, is reliable information and an easy access to it. The situation they are living right now is a confused mass of data sources, most of which are not trustworthy. On the other hand, the reliable information collected by the authorities are too often kept away from the public. The laws around ice fishing are confusing as well and do not seem to take in consideration the most up to date ice conditions and climate changes. Fisher Cloud is our solution to this problem: a system of real time data collection and delivery. All the information available is collected and refined by this platform, which is operated and maintained by the Fishermen Club, and then delivered in three different channels to the community. The main channel is a web app: it display a map of the fishing areas, containing all the data together, organized by zones. As the user opens the web site/app he sees the general map with each area colored red, yellow or green according to the most up to date ice conditions. As the user clicks on the area he’s interested in, he is introduced to a more specific information about it. A pop-up shows weather condition and ice thickness; a sidebar shows a general warnings, calculated by the system considering all the factors. Furthermore, the sidebar displays the weather and ice thickness history of the recent days. 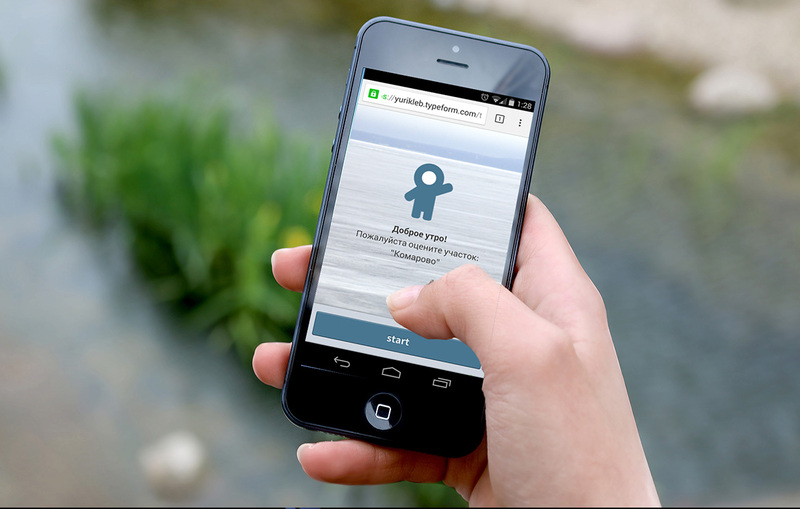 A rating and reviews section, shows live data collected by the fishermen community which makes the information even more reliable. For less tech-savvy users, we thought about two other channels: a text service, which delivers specific information through sms, and a digitally generated radio station, which transmits general and area specific forecasts and provides emergency alerts through the day. 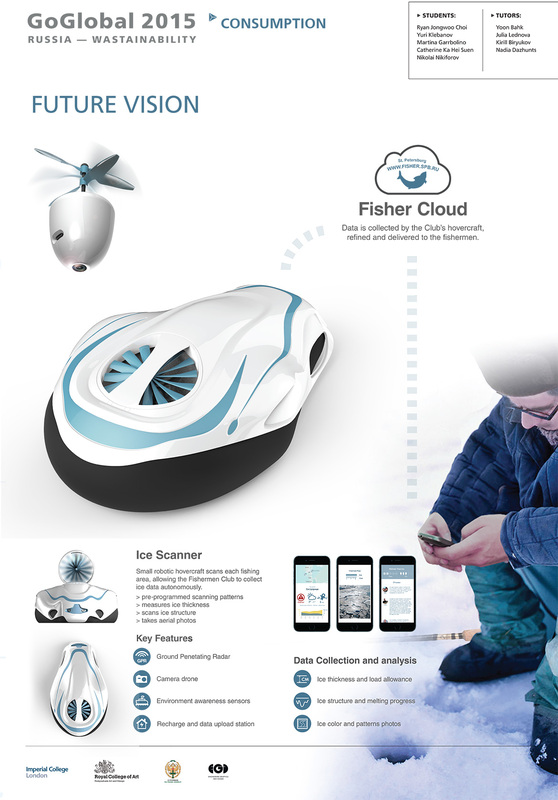 As our future vision we also developed a concept for a small robotic hovercraft, that will allow the Fisher Club to collect data autonomously. It will scan each fishing area in pre-programmed scanning patterns, providing data of ice thickness, structure and appearance. To do so, it will be equipped with a Ground Penetrating Radar (GPR) and a camera drone, which will fly up and take pictures of the ice texture. In our vision the club will posses many of these robots, with recharging and data upload stations along the shores.